ABC is diving back in. Recently, the network announced they’ve begun casting for a 10th season of Shark Tank. The reality series features entrepreneurs seeking investments from a group of savvy, wealthy investors who are “self-made” tycoons. The “sharks” include Robert Herjavec, Kevin O’Leary, Barbara Corcoran, Daymond John, Mark Cuban, and Lori Greiner. Ratings have dropped for Shark Tank in recent years, but the show is still a solid performer for ABC. Season nine, the most recent, averaged a 1.03 rating in the 18-49 demo and 4.205 million viewers. For comparison, season eight averaged a 1.18 rating in the 18-49 demo and 5.181 million viewers. Casting for season 10 of Shark Tank begins on March 9th. ABC has not yet announced a premiere date, but you can read more here. What do you think? Do you watch Shark Tank? Are you glad it’s been renewed? More about: ABC TV shows: canceled or renewed?, Shark Tank, Shark Tank: canceled or renewed? It is good to see entrepreneurship and support in action. America needs this and became great because of it. We need to support more innovation and Shark Tank does it well. Thank you all. I love shark tank! Besides being entertained by their antics! I learn a lot about new products &. Dream of being an inventor some day! 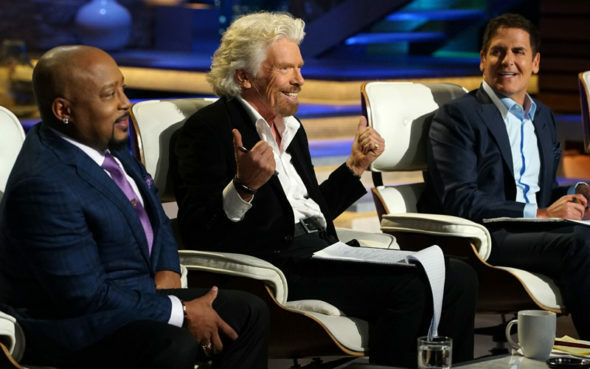 I began watching Shark Tank when – first viewed on ABC. Really loved it. As casts change, audiences loose interests. As a result – low ratings. Perhaps consistant and diversified casts is best. I love the show. It shows the creativity of people. The shark’s are very respectful whether they like the product/idea or not. I saw tonight’s show (10/7/18) and enjoyed it, but it was just not the same…something missing…Robert!!! To me, there is a special something when the Shark Gang is all together. Love it! I’m amazed at how many people invent things that are so simple at times! I can say that almost ever episode I say, “Why didn’t I think of that?! That’s so neat or (you fill in the blanks).” Love love love Shark Tank! Keep it rolling! One of the best shows ever! Can’t wait for the next episode! We are grandparents and both of our grandchildren (female & male)17 and 13 have been watching “Shark Tank” with us for the last two years. They like discussing the episodes. Glad to hear Shark Tank is coming back! One of my favorite shows. I really like Shark Tank, love to see innovative products and support from the Sharks. Shark Tank is the most addicting show to me….